Today at the Finovate conference in San Francisco, a company called edo announced the introduction of what it describes as “geocommerce” offers, which, as the name implies, are offers and deals from merchants that are tied to a location. But there’s more to the edo platform than that. The company also targets its offers based on your previous transaction history – not entirely unlike the early stage startup BankOns that Capital One just snapped up yesterday. More importantly, what’s interesting about edo is how those offers work. There’s no check-in, no need to launch a mobile app, and no special hardware or Point-of-Sale modifications on the merchant’s side. Instead, edo ties to consumers’ bank cards, allowing them to not only receive the offers in real-time, but receive their discounts in real-time, too, immediately after checkout. By simple, what edo means is that using its service requires very little effort on the consumer side. All you need is a credit or debit card. In fact, in some cases, you don’t even need to sign up – you’re opted in by default by your bank. (Opt-out is available, of course). But because edo is a white label product, it’s up to the participating financial institution to decide whether or not the service is opt-in or opt-out. As of today, edo has gone live with 140+ bank and financial institutions, the largest of which are Fifth Third Bank and Ally Bank here in the U.S. And edo says more large institutions will be coming on board over the course of the year. So how does the service work? For starters, the banks will target users based on their spending behavior. And really, just the spending behavior – the banks don’t need to pull any personally identifiable info, your demographic profile, or anything else but how you like to spend and where you spend in order to start sending you offers. And you don’t need a mobile app to receive them. 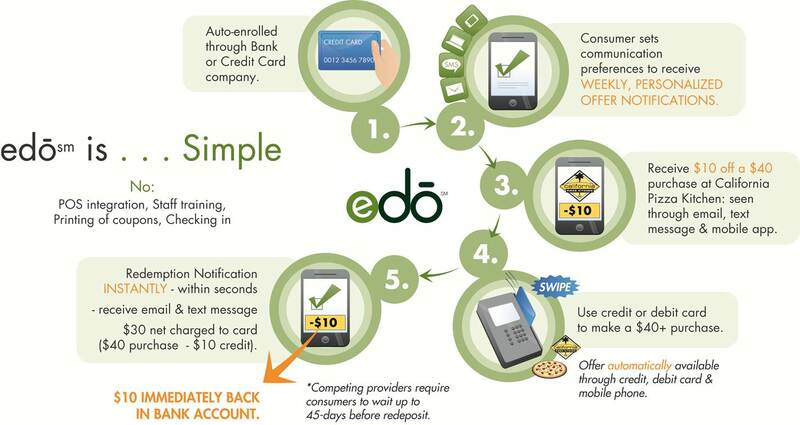 Although a smartphone application is part of edo’s platform, non-smartphone owners can choose to receive offers via text or email. Upon redemption, which again, involves no extra steps that would make it different from a normal transaction (it’s just a swipe of the card as usual), the offered discount is immediately credited to a consumer’s account. Handy. Fagel says that edo is moving further into its testing period with its banking partners this summer, and by the end of summer, will have 10 million consumers on the platform. By Q3, it will have 50 million – a number which is being determined by the large banking partners expected to go live by then. Even in its early days, banks on edo have seen their card volume increase by 20%, driven by increase use and spend on the card. On the advertisers’ side, they’re seeing redemption rates of anywhere between 2% and 75%, but the average is around 2% to 4%. However, in certain categories like dining and quick service restaurants, redemption rates are 10% to 20%, Fagel says. “We’re also seeing quite a bit of repeat purchase – individuals who had not been at a location in the last 60 to 90 days,” he adds. For example, in a campaign with a national sub shop, following the first redemption of the offer, 30% of consumers made 1-2 more visits and 40% made 3+ more visits. Fagel attributes the success here to the way that edo can not only attract new customers, but also encourage current customers and reactivate lapsed customers to use the discount being offered. Edo currently has partnerships with 200 national and local merchants, and it takes its cut from the overall purchase price paid at checkout. The rate varies somewhere between 5% and 10% on the target basket, with the advertiser/merchant paying out both edo’s cut and the discount to the consumer. While the service will only initially be available to banking and financial services institutions, which will then offer it to their own customers, edo is already working on other direct-to-consumer offering through other partners, like PageOnce, for example, which will allow others to sign up, too.